It's been almost a decade since influential roots rockers The Last Hombres produced anything of note; but their latest release, shows that this band's been doing everything but resting. 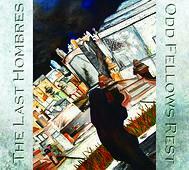 It's been almost a decade since influential roots rockers The Last Hombres produced anything of note; but on their latest release, Odd Fellows Rest, the addition of Chris James on the Wurlitzer and Tom Ryan on drums to original members Mike Meehan, Paul Schmitz, and Russ Seger shows that this band's been doing everything but resting. At times rollicking and at other times introspective, Odd Fellows Rest knocks the rust off that trademark folky twang while simultaneously polishing up their weepers, like the aptly titled track, "Testify" and the Tom Waits-esque "Streetlights." Granted, there's some serious guitar-slangin' goin' on throughout the album, augmenting the Americana vibe reflective of their long intermingling with now-deceased members of The Band, Rick Danko and Levon Helm. Sad and sweet yet stimulating and reassuring, Odd Fellows Rest will certainly please fans of Redemption-era Hombres, but more importantly, will introduce these unsung heroes of roots rock to a whole new generation of listeners.